Mark Wahlberg drops in. Tom and Gisele, too. Mick Jagger and Sting have stopped by. Bruce Springsteen adores the Philly Cheese Steak spring rolls. Oprah came in with a party of 30. Davio’s restaurant is also a magnet for athletes. People still talk about the time the Yankees and Red Sox both ended up there - Joe Torre spoke to Trot Nixon, but that was it. More recently, the Vancouver Canucks ate there before games 3 and 6 of the Stanley Cup finals. Davio’s Northern Italian Steakhouse is one of a handful of restaurants in Boston that regularly appear in gossip columns announcing which bold-facers ate what there. Sure, the food garners raves. Yes, it’s in a prime Park Square location. Celebs who stay at the Four Seasons simply walk over, sometimes on the recommendation of the hotel concierge. And no, in case you’re wondering, their meals aren’t comped. DiFillippo, who loves sports and music, long ago learned how to turn those loves into guests. He has made friends in high places. It was at the request of his close friends Robert and the late Myra Kraft that he opened a Davio’s at Patriot Place in Foxborough three years ago. 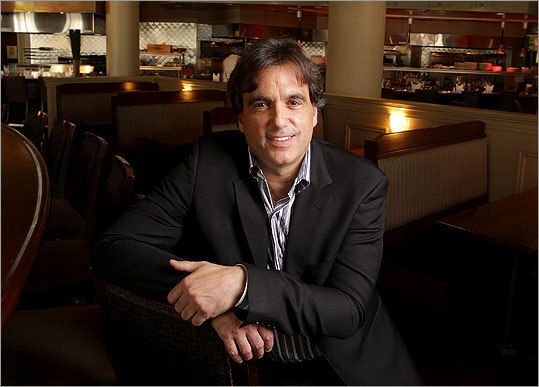 Members of the extended Kraft family have long dined at Davio’s, and team members also go there. In 1985 when he was 24 years old, DiFillippo opened the original Davio’s on Newbury Street. In 2002, he relocated to Park Square. Now there are three more Davio’s: in Foxborough, Atlanta, and Philadelphia. And he owns Avila, also in Park Square. DiFillippo is a master networker who has worked hard to “brand,’’ as he puts it, the Davio’s name. To that end, he has created a line of frozen Davio’s spring rolls, which sell by the millions in grocery stores throughout the country, and he recently became the culinary correspondent for “styleboston’’ on WCVB-TV (Channel 5). Carolyn Fox, contributing editor at the Improper Bostonian, says Davio’s attracts athletes and others because it’s a “winning combination of steak house and Italian.’’ She also credits DiFillippo’s outgoing personality for drawing people in. “When Mick Jagger was here, he ate in peace, though there was a little frenzy when he left,“ DiFillippo says. He also keeps track, via computer, of where his regulars - famous or not - like to sit and what they like to eat. Trot Nixon first took Red Sox slugger Kevin Youkilis to Davio’s in 2004, and it quickly became Youkilis’s favorite spot. “Great food and great service is always the key to an athlete’s heart,’’ Youkilis says. “Steve being a great host and a great guy is what makes him so successful. He is always smiling, laughing, and cracking jokes.’’ The two have become good friends. Former Patriots star Tedy Bruschi has been going to Davio’s for a decade. Before he has even ordered his meal, a plate of Philly Cheese Steak rolls will appear. “I always go in for them, so they just bring them to me,’’ Bruschi says. He also knows he can eat without interruption. But Davio’s does not mind publicizing a celebrity visit after the fact. Though DiFillippo doesn’t comp his guests - unless it’s a friend he’s meeting for lunch or dinner - he does donate to their causes. In 2008 he spent 10 days in Israel with the Krafts; this year he attended a seder at their home. In 2009 he and Regan visited the Polish death camps. Last year, after raising $500,000 for the Anti-Defamation League of New England, he received its Torch of Liberty award. He is the current vice chairman of the organization. Hot restaurants get hit up constantly for charitable causes. DiFillippo won’t say no to customers he’s friendly with, like Youkilis’s Hits for Kids Foundation. “Anyone who does anything for kids, sign me up,’’ says DiFillippo. He gives to cancer causes because both his brother and father had cancer. He supports hunger relief and his sister’s charity, Raising a Reader. Unlike some of his competitors, DiFillippo is not a celebrity chef. His degree is in business from Boston University. He grew up cooking with his Portuguese mother and Italian father, though he kept it quiet. After college, he attended Cambridge School of Culinary Arts, but he leaves the cooking to his chefs Eric Swartz and Steve Brown, who have been with him almost since the beginning. DiFillippo, whose four children range in age from 11 to 23, says he grew up with a father who always brought people home for dinner and a mother who accommodated the last-minute crowd. His oldest son is a Boston University student who volunteers at Community Servings. His daughter is working on a master’s degree in social work. Wayne Lebeaux of Framingham, who works as a manager or assistant for various entertainers, has been going to Davio’s for years. He always eats the same thing: chicken parmesan. He also brings his clients there: Ringo Starr, Springsteen, David Crosby, the members of the rock band KISS, and others. “Because it’s private and the food is so freaking good,’’ says Lebeaux, who was the inspiration for Davio’s Chicken Parm spring roll; he’s even credited on the box. Once, Springsteen asked DiFillippo to teach his personal chef how to make the Philly Cheese Steak spring rolls.